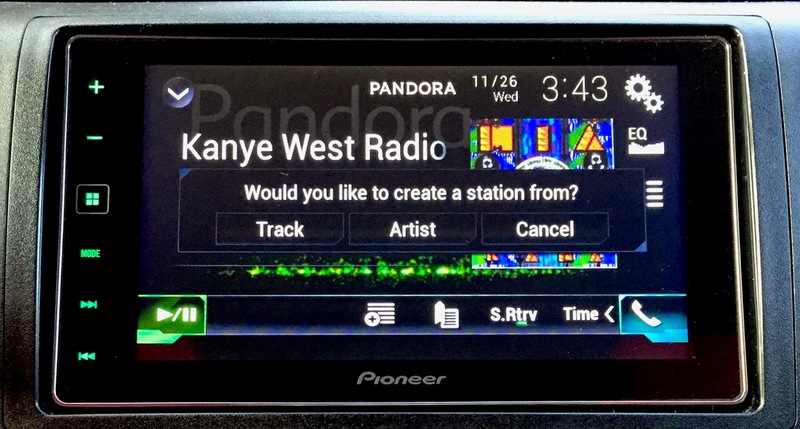 Pioneer's 2014 models of head units include the Pandora Station Creation feature. This feature was not available in older head units like the AppRadio 3. As the name suggests, you can now create new stations in Pandora right from your head unit. But this feature has a one limitation, probably for safety reasons. Keep reading to find out how Pandora Station Creation actually works. Pandora is available on most of today's head units from a variety of aftermarket manufacturers. With their 2014 line of products, Pioneer's head units are capable of allowing users to create new Pandora stations. This can be done over both, wired and Bluetooth connections. To create a new station, simply click the "plus" button in Pandora on the head unit. This will allow you to dynamically create a station using the current artist name or track information. An industry first, all new Pioneer DVD receivers allow users to quickly create new Pandora stations while connected to an iPhone or compatible Android smartphone device. Models that are equipped with Bluetooth enable wireless control and display of Pandora internet radio content, no longer requiring a physical cable connection with a smartphone device. Users can simply touch the "plus" icon on the receiver and the unit will display a pop-up menu to create a station dynamically using the artist name or track information. The above description is from a Pioneer press release earlier this year. Although it mentions Pioneer DVD receivers (AVH-X1600DVD, AVH-X2600BT, AVH-X3600BHS, AVH-X4600BT and AVHX5600BHS), the feature is available on all 2014 head unit models (five NEX receivers and AppRadio 4 SPH-DA120). Limitation: The one big limitation in Pandora Station Creation is that you can't create stations by manually entering an Artist or Track name. Stations can only be created based on the currently playing track. For example, if you're listening to 'Artist A Radio' which is playing 'Artist B - Song X', you can create a new station based on either Artist B or Song X. So if you have the sudden urge of listening to a new artist station while driving, you will have to pull over and do it on your smartphone when not connected to the head unit. Genres: The other way you can create new stations in Pandora right from the head unit, is by clicking on Genres when you hit that "plus" button. There are a wide range of genres you can choose from.